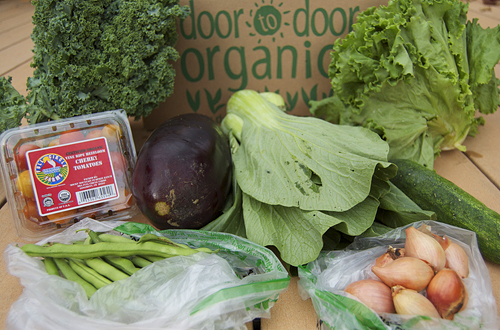 My box last week had all sorts of delicious things, including bok choy, eggplant, kale, shallots, tomatoes, lettuce and a cucumber. 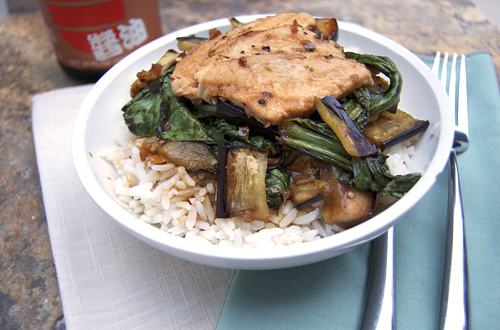 I decided to use the bok choy and eggplant to make a tasty Asian dish. This Korean barbecue sauce is delicious. It has a hint of spice mixed with sweetness. This barbecue sauce is very thin and works as a sauce for stir-fries as well. In a medium saucepan, heat 1 tbsp olive oil over medium heat and sauté the garlic and serrano until soft (about 3 minutes). Add the soy sauce, brown sugar, vinegar and water and bring to a boil, stirring frequently. Reduce the heat to low, add the sesame oil and stir to combine. Set aside and keep warm. Heat the grill to medium-high heat. Brush the eggplant slices with olive oil and season with salt and pepper. 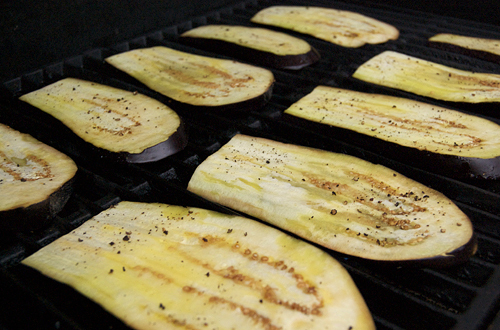 Grill the eggplant until soft (about 3-4 minutes per side). Meanwhile, heat 1 tbsp olive oil over medium heat in a large sauté pan. Add the bok choy and 2 tbsp of the barbecue sauce. Stir-fry until wilted (about 3 minutes). Chop the eggplant into bite-sized pieces, then combine with the bok choy. Serve over rice with extra barbecue sauce and chicken (if desired). Disclaimer: I received a free box of vegetables for this post. That is a good program. I really like Asian influenced eggplant dishes. Food looks wonderful! A good program. What a cool program to take part in! You put together a great meal with all those ingredients! What a beautiful recipe and a great program you belong to! I don’t live in an area it services, but it’s definitely worth checking into for those who do! That box looks like a treasure chest and this meal looks fantastic! 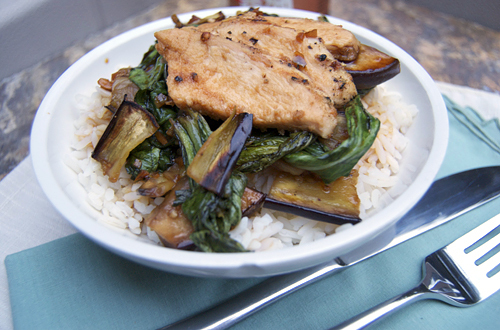 Asian eggplant recipes are so great. Thanks for sharing! Oh I wish I had this for dinner tonight!! I love this kinda meal and I am so sad that I don’t belong to an area that they deliver to. I would love to try that sorta service, I am always worried I wont eat it all since I live alone. I wish my CSA box delivers bok-choy 🙂 Great recipe, thanks for sharing. I’m excited about this recipe! Grilled Eggplant & Bok Choy w/ Korean BBQ Sauce = A party in my mouth. Found this post after googling “eggplant bok choy recipe”. I just made this for dinner today. Sauce was very flavorful, if a little to sweet to my taste. I didn’t see any Korean-ness in the sauce, though (and I’m Korean). Btw, what are you supposed to do with chopped green onions? I used them as garnish but I was wondering if they’re intended otherwise.